Tips On Strengthening Your Immune System During Pregnancy To Ward Off The Colds And The Flu, Including The H1N1 Swine Flu. As an pregnant mom-to-be, there are things you can do to strengthen your immune system to prevent getting sick from colds and the flu. By doing so, you’re building your unborn baby’s immune system, too. A strong immune system will help you both fight off body invaders. Experts give us their top tips to help safely strengthen your immune system during pregnancy. Pregnancy has a definite impact on the body’s immune system. “During pregnancy, the immune system is suppressed so the father’s sperm, embryo or fetus isn’t rejected as something foreign,” says Brad Douglas, M.D. and OB/GYN Expert for JustAnswer.com. As a result, white blood cells (aka immune cells) lose some of their capability to fight off your body’s enemies, making you more susceptible to illnesses and infections while pregnant. With the threat of H1N1 swine flu so present among us, we need those white blood cells be able to carry out their important work. There are ways to boost your immune system to keep both you and your baby healthy. Among the top recommendations? “Take vitamins, eat nutritious food and exercise” advises Douglas. “A diet rich in whole foods will support your immunity,” says Latham Thomas, a certified holistic health counselor who specializes in maternal and child wellness. “Eat lots of fresh garlic, green leafy vegetables, fresh citrus, and lots of water,” says Thomas. Fruits and vegetables as carotenoids will increase your immune-fighting ability while still protecting the fetus. “Get a good prenatal vitamin to keep you boosted with vitamins and minerals,” recommends Latham. Zinc – Take 30-50 mg daily to prevent a cold or flu or to shorten their duration. Of course, check with your doctor before taking additional vitamins or supplements. 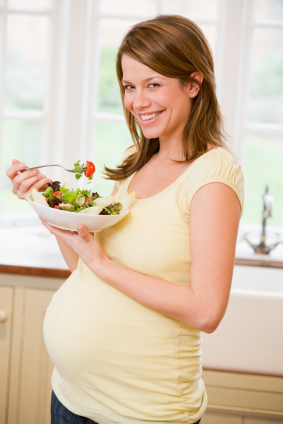 For more tips on your pregnancy diet, check out 10 Ways to eat smart during pregnancy. “Women who exercise tend to have more appropriate weight gain, less symptomatic pain, decreased gestational diabetes, improved blood pressure control, improvement in immune system response, and even better deliveries,” stresses Douglas. Stephanie Larson couldn’t agree more and founded Dancing for Birth™ Prenatal Dance Classes in an effort to show the world that pregnant women are strong – not delicate. “A regular exercise program benefits the cardiovascular system, improves blood flow, flushes toxins, keeps endocrine system working well, circulates antibodies, and reduces stress,” says Larson. After a good workout, ask your partner for a massage. Massage has been shown to increase immune system function. Be sure your exercise program is done under the guidance of your doctor. The best way to nurture your immune system is mental, not physical. “Your emotional attitude can be either helpful or detrimental toward your immune system,” says Douglas. With the natural challenges of pregnancy, however, being stress-free is easier said than done. Seek out social support from friends, family and other expectant moms. Find positive ways to work out differences with others, especially your partner. You don’t want to fight in front of the baby! Get more tips here on how to relax and ward off stress during pregnancy. If you come down with the flu while pregnant, you’re at a greater risk of serious complications. The Centers for Disease Control and Prevention (CDC) encourages pregnant women to get both the seasonal influenza and the H1N1 (swine flu) vaccines. (Note: The CDC advises that the nasal spray versions of the vaccines are not appropriate for pregnant women.) Check with your doctor for more details. Should I get the flu shot during pregnancy?